I must admit I am a huge fan of open shelves. 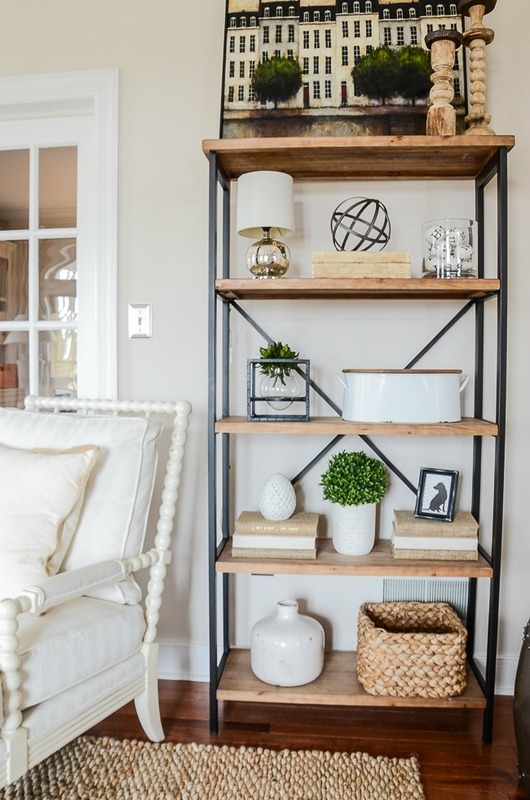 Open shelves are such a fresh and updated look for almost any home. And they add so much visual weight and interest to a room. 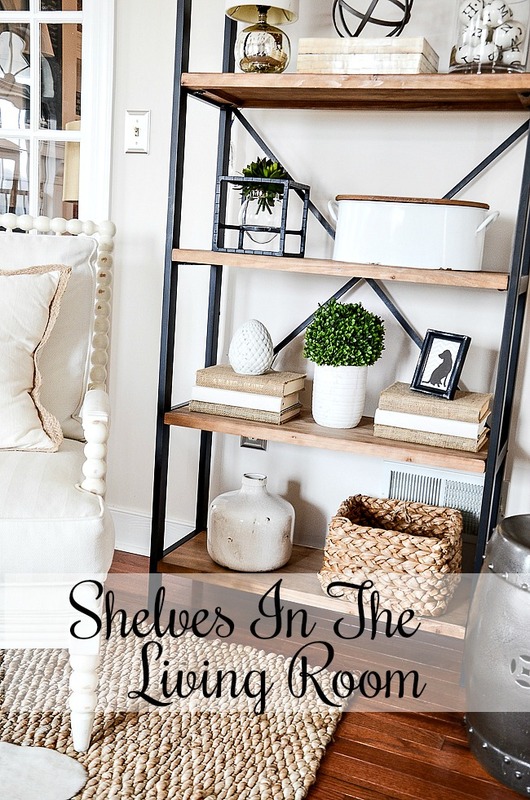 I recently added a small shelving unit in my living room and there are so many possibilities for styling them. 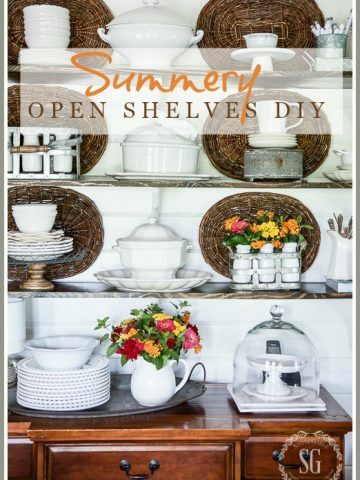 Here’s a look at open shelving in decor! Don’t miss this episode. 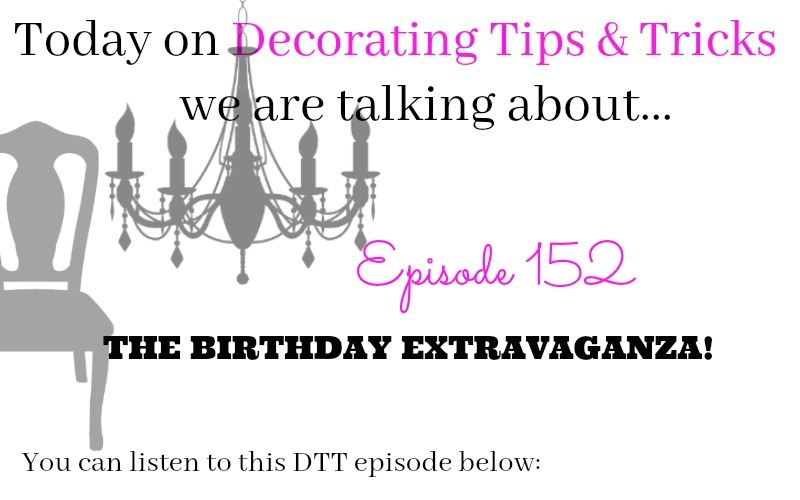 Today two of our hosts share the same birthday and we are celebrating with lots of tips for making those birthday people in your life special! HAPPY BIRTHDAY, ANITA AND KELLY! lots of ❤️! I’ve put many things in this corner of my living room. A hutch, a huge carved wall hanging, pictures, and subway art. But just like Goldie Locks, nothing was “just right”. That is until I decided to add this slightly industrial looking shelve! 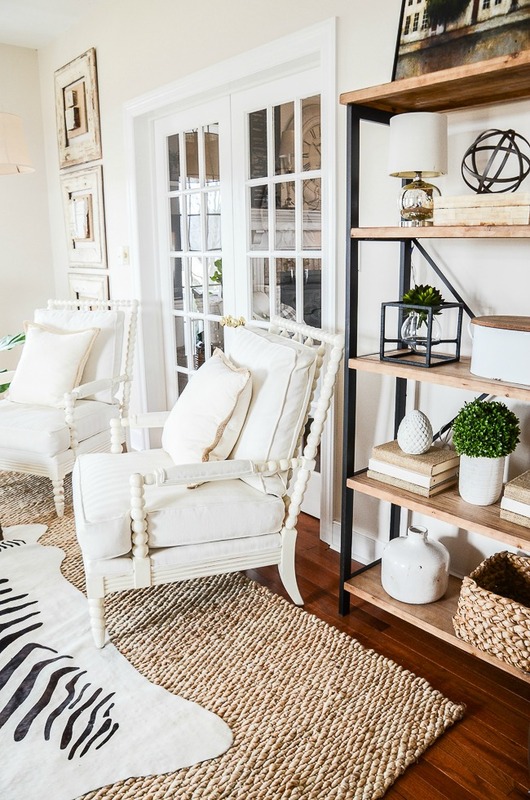 My living room can look a little formal for my taste so I use a few touches of refined farmhouse and industrial to give it a much more approachable look and a comfortable feel. You can see the shelves HERE. Shelves give height and interest to an area. And this area in the living room certainly needed both. Once the shelves were assembled the fun part started… styling them! I pulled out a bunch of decor elements I thought might work with the shelves and the living room. This was certainly a big “shop the house” project! You might have noticed the picture that usually hangs over the sofa is now on the top shelf! I wanted the visual effect of the shelves to be taller than the French doors. And be close to the height of the architectural art that flanks the left side of the french doors. Our eyes need to move up and down and around furniture to perceive a room to be interesting and beautiful. So building height on some of the walls of a room is so important! I still have a few tweaks to make on the bookshelves and I’ll show you those next week. Could one of your rooms benefit from open shelves? Just be very careful to pick out the right style and size for your room. Do you want to dress it up? Down? Make a room feel cozier? 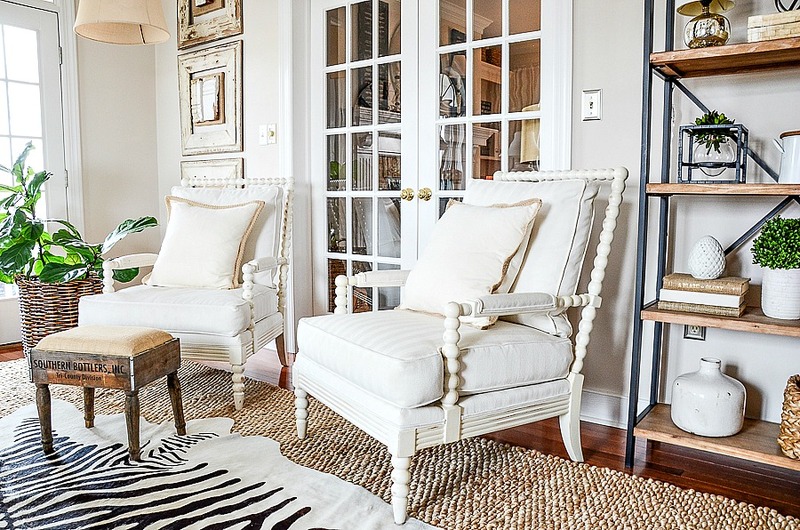 Does a room in your home need a visual height? These are all great questions to be asking if you are thinking about updating a room with shelves. I love your style and I like a bit of mix up. 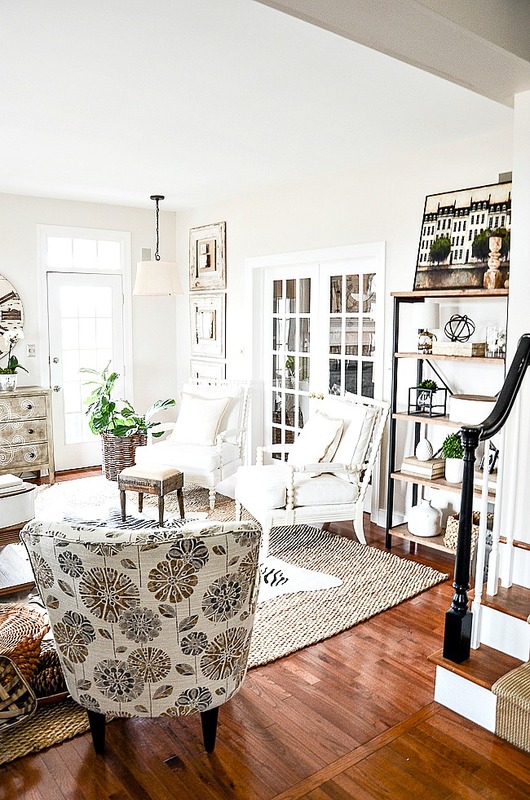 You have beautiful traditional pieces with industrial and farmhouse touches. I like your shelves and well done with the decor arrangement. Pretty! I love the shelves in your living room!! Sometimes we need to add a more casual piece in a room that is becoming more formal than we want. I had to do the same thing in my living room. Love your blog and adore the 3 of you on your podcast!!!! As always, your creativity comes alive with the addition of these open shelves! Contrary to some comments given, I think the touch of industrial adds just the element of surprise that a room needs .. perhaps “unexpected”. I am not sure if the picture on top is exactly my fav, but I do understand how you are looking to balance the other side. I’m looking forward to you sharing next week the other “tweaks” you have done. Bravo to you for trying something new! Yes I needed a bit of tension to make my room look less formal and fussy! I love the composition of decorative elements on your shelves. It always takes many iterations for me to be satisfied with these kinds of arrangments. Yours is just right and very well balanced. Sorry, I too find the shelf to be much too industrial for the beautiful softness of your room. Although I like the picture, it looks just awkward on the top shelf. In my opinion it would be much better alone as a focal point. Always love it when your creative juices get flowing. I would never thought of putting a shelving unit in that space. Did I miss where you moved your beautiful hutch? Love your new open shelving unit! I like open shelving also! 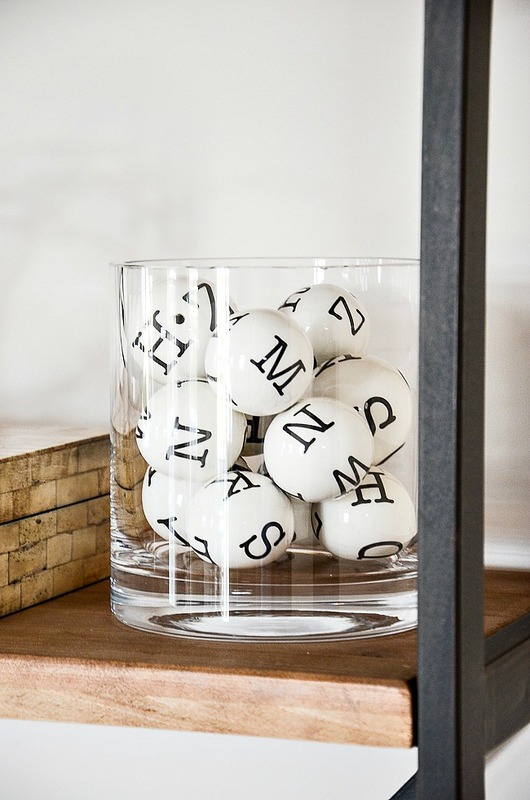 I think they add interest to a room also! Nicely done Yvonne! I like this update! I’ve been wanting to change something. My bookshelves are just partial of a set and are old and bulky but they do anchor a large wall. I love the look of the open shelves because they aren’t so heavy. I like how the picture looks on the top. Thank you for sharing this so we too can be inspired! Not my favorite thing that you have done but I love your sense of decor adventure. I’d have to agree with some other comments that the picture on the top seems out of place. I think that when you “study” your pictures you will make the necessary tweaks to get it Stonegable perfect! PS: I totally agree that the top shelf needs to be balanced with the adjacent wall decor. Perhaps making the middle shelf “fuller”and keeping the other shelves sparsely staged like you have them would create appropriate overall balance? I don’t know but that’s kind of what I see in my mind. We all know that you’re the pro though! ? I love them and the price is terrific. I have never before offered alterations before but today I have my ‘big girl pants’ on and I am going to say I think that lovely picture on top of the shelf looks like it was dumped up there because you couldn’t find anywhere else to put it. I’m eyeing that tiny black frame with the black dog inside. Lovely! I know you also have one with a bird and I wonder where you get those? Beautiful and fun at the same time! I saw your email and I’m looking for tips on decorating. I have an open shelving unit that I love but recently listed it for sale because I needed the space it is in for something else. I never thought of moving it to the living room, but thanks to you, I am going to give it a try. I hope it looks as good as yours. 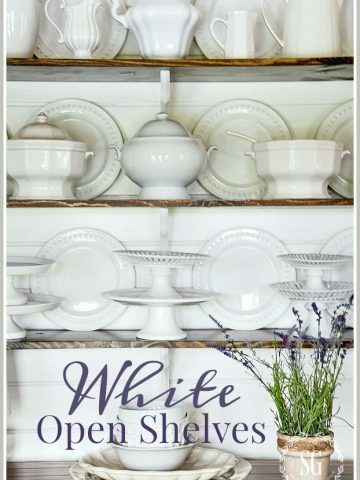 I love these shelves and the way you’ve decorated them! Perfection! Yvonne, after hearing you so hoarse on the podcast, I have been worried about you! I hope you are feeling better and that the “doc” in your house is a good nurse, also! Watch out for the flu and pneumonia. It is rampant in the “SOUTH”! Hi, Yvonne! Out of curiosity, I always read what others have posted before providing a comment or opinion. Here goes…I know how much you LOVE your Parisian street painting, so I think it deserves the most prominent spot in your room. I thought it was total perfection hanging over the sofa…no competition! I think you will notice that it appears “heavy” on the top shelf, since the painting is very weighty and the other shelves are truly “open” and somewhat contrived. The unit has the industrial look that you like. I would love to see you shop your home a bit more to get it just right…like you always do! Would you agree that a “surprise” element is needed? I LOVE to see designs through friends’ eyes, so I hope you consider this a comment from a friend. As you always say…in the end be true to yourself and what makes you happy!!! See! I pay attention in class! This may be JUST the solution I’ve been looking for for an empty space in my Gathering Room!! Thanks for all your inspiration, Yvonne…. in the blog AND your Wonderful Podcast!!! Good choice!! I really like these shelves and they do add quite a lot of visual interest after dressing them up. And I have always admired your picture on the top shelf.. ? I love your beautiful home and enjoy many of your ideas but I agree with a few of the comments stating the pictures on top of the shelving isn’t working. I personally have always loved this room of your home and have admired this picture. I liked the original spot where you had it. 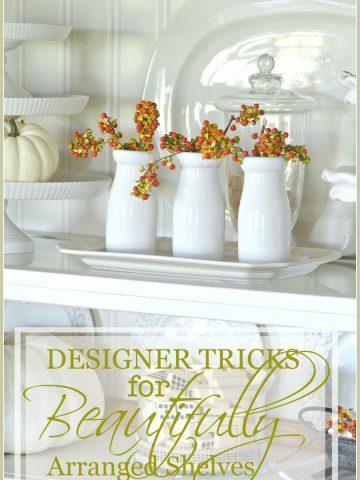 Hate to give a negative comment because you are one of my favorite decor blogs. This is just what I have been looking to do. Love your ideas and style! I agree with Beth, the shelving looks too industrial for this room. It looks like garage shelving. Your room is so nice and this does not do it any justice. The art looks awkwardly placed on top with the heating vent. Just my opinion but not meant as a criticism to you. I do enjoy your post and blogs. 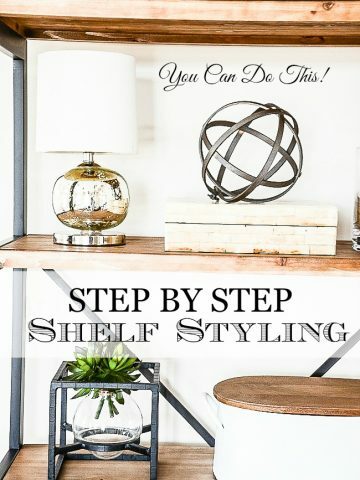 You have given me an amazing idea with this shelving unit post! ALWAYS always always find something of unique interest from you, my precious friend. Houston has had a real winter this season, even snow twice !! Good morning, Yvonne. Thank you for the great tips as always. I have to be honest…I am not loving that shelf in your room. It just doesn’t look like your style, and to me, it almost feels like the balance of the room is upset. I am trying to visualize what an all wood shelf would look like, and I’m thinking maybe the industrial structure is too harsh for your beautiful soft room. Sorry for the negative comments, but I thought maybe you’d like to hear a different perspective. I am certainly no designer, and I trust your expertise! I will look forward to seeing how you style it for different occasions, seasons, and holidays! I think the shelves look wonderful in your living room, and I agree that the top shelf needs something tall for balance, but I feel the picture is too tall and too wide. With it being the same width as the unit, It overpowers. I know …. everyone has their own opinion. While I love the idea of the shelving, especially that it has the industrial look, I feel that the art gets lost. That picture has long been a favorite of mine in your living room. However it is such a statement piece, I feel it should be placed somewhere with visual prominence. I think it gets lost up there. I’m sure, knowing you and your decorating savvy, will find something else to add height to your shelves. These shelves look wonderful. I have similarly sized open wooden shelves angled in a corner, between 2 very large windows. The windows, which are 6’x8′ are at a 90 degree angle which prohibits the placement of furniture against 2 window walls. I try to keep them sparsely decorated so as not to obstruct our view. After studying yours, am thinking I need a tad more texture. Usually try to follow your basic vignette ideas, such as an organic, limited colors, etc. Will be rethinking these. Many thanks for sharing yours. Love the look of the open shelves. 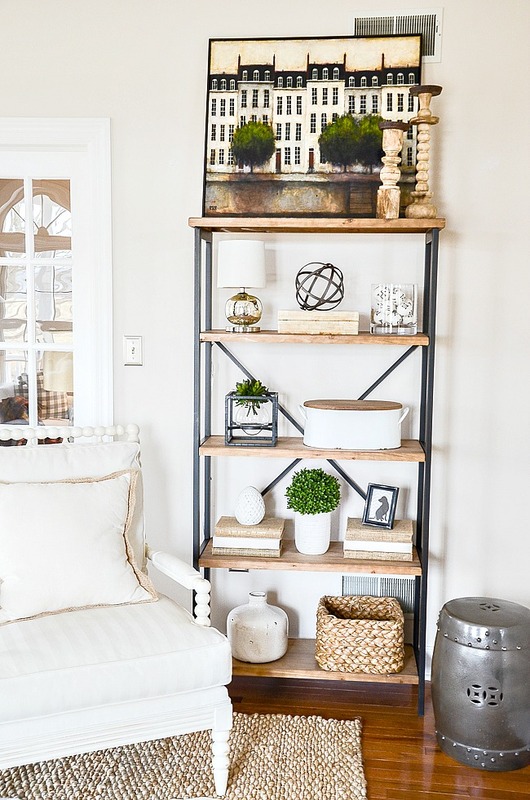 Could you share where the shelving unit was purchased? Thank you! Beautiful! There is a big blank wall in my great room that I’ve been wanting to do something different with. You’ve got me thinking about shelves now! Beautiful as always! Keep the ideas coming. I learn so much from you. I have seen the picture in several posts and always love it. Where did you get it? Love it – and love the way the room looks so balanced with the height of the framed items on either side of the doors but not matchy, matchy. My best time to take a new look at my living areas is after I put holiday items away and that is when I tell my husband I am playing house. He knows things get rearranged and some of the paint brushes come out. I like the industrial looking open shelving. It is also fun that you shopped your house to compliment the finishing look. I could do this in my family room. I love the new addition of the shelves in your room . Would you share where you purchased ? Lovely addition Yvonne! Would you please share the source as these look so well made? Love the pops of green throughout the room tying it altogether…especially on the shelves where the trees in the picture and plants also have similar shapes. Very nice styling. Curious about the balls…I know nothing about bingo balls but could they possibly be the ones you mentioned in a podcast? p.s. love the podcast, you ladies are such fun and so inspiring! Love the addition of the shelves! They really do perk up that corner. I especially like that they are not “overstyled” in that everything on them looks as though the objects belong there and the look simply flows. Bravo! Can’t wait to see what else you have in store for them.